Are you ready to be different than everyone else? Are you wanting to build something out of a box? If you are saying yes to both questions, shipping containers may be a route for you! ISO containers are a great way to build a unique structure that can be within reach of the average person. Shipping containers were designed for storing and transporting goods. 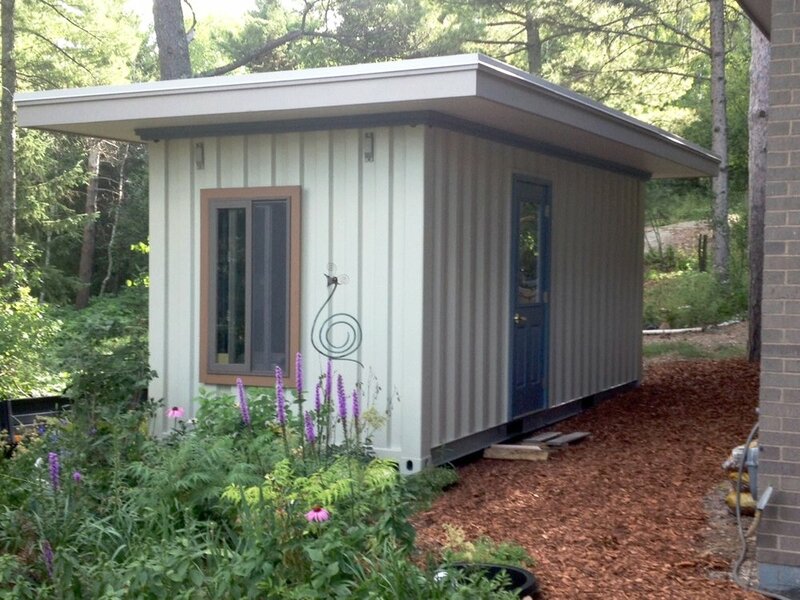 However, there are so many different ways to upcycle steel containers into a wide variety of new structures. Storage and Sheds. Sure it is the most basic use, but containers are great at storing things. 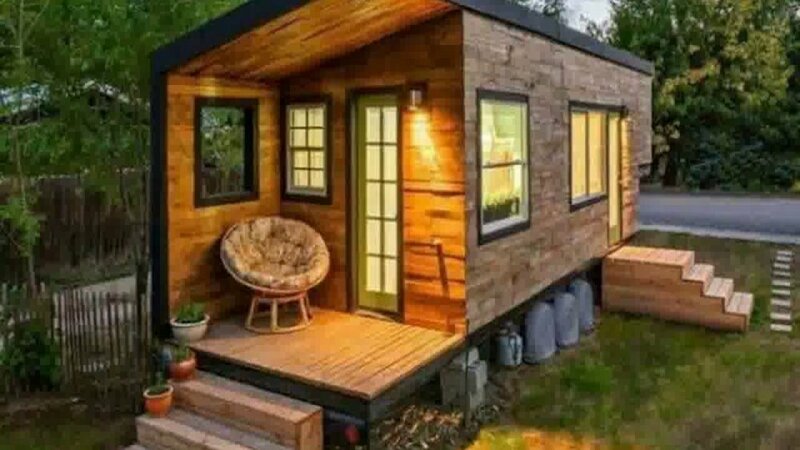 Cabins, guesthouse, tiny homes and vacation/main houses. The hottest trend in the past few years in containers is container architecture. Offices and building extensions. Containers can add in extra space for people too. 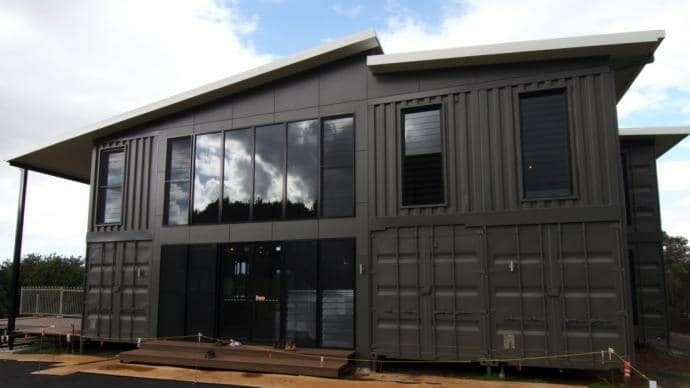 Containers can fitted out with insulation, electricity and desks easily. Fire training stations. Containers can be burned again and again! As long as you replace that wood floor with something that doesn’t burn. We have all sorts of ideas on how to change the space to keep your team on their toes. Saunas, pools and pool houses. Who doesn’t want one of these?! Food trucks, restaurants and bars. Containers make everything more fun! Portable toilets. Ground-level entry that can be moved to wherever you need them. And everyone will be happy they’re not a port-a-potty. Retail shops and malls. Downtown Container Park in Las Vegas is a perfect example of how to take a great, creative idea and make it a reality. Las Vegas, here we come! Theaters. 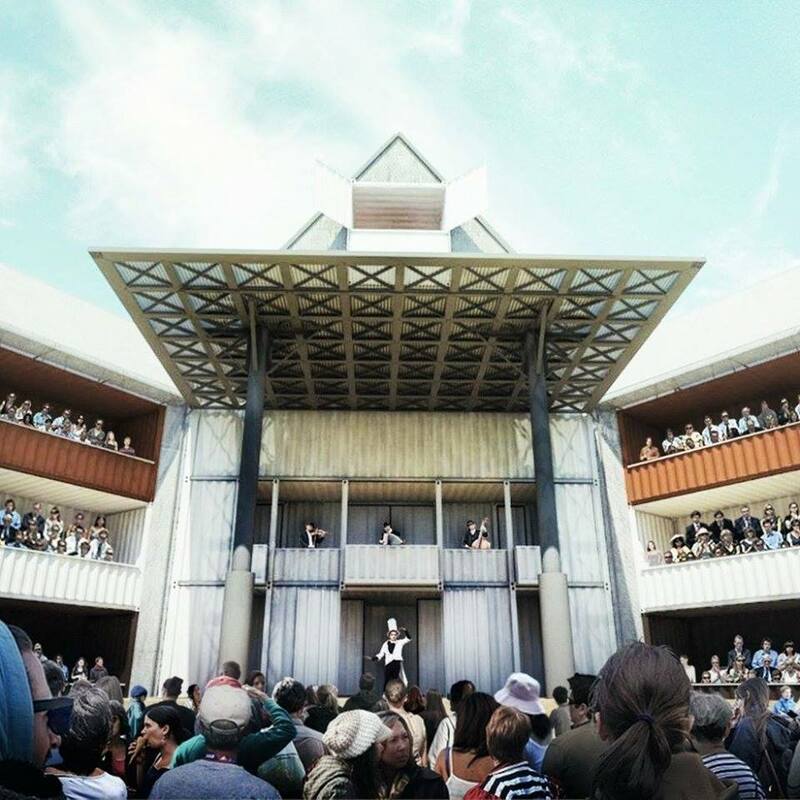 Detroit Globe Theater (A Super Cubes customer) is a fantastic example of taking something old - Shakespeare’s Globe Theater - and putting a fresh twist on it. The classic feel of live theater in the round with the ability to transport the theater as needed. Bistros and coffee shops. Starbucks has been running with this idea for a few years, but there are so many more takes on getting caffeine to those in need. 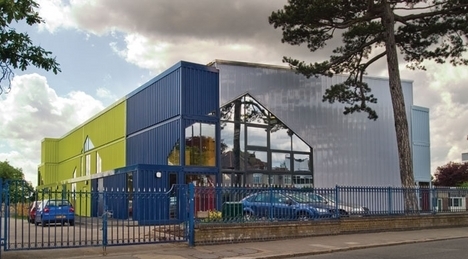 Studios, art gallery and workshops. 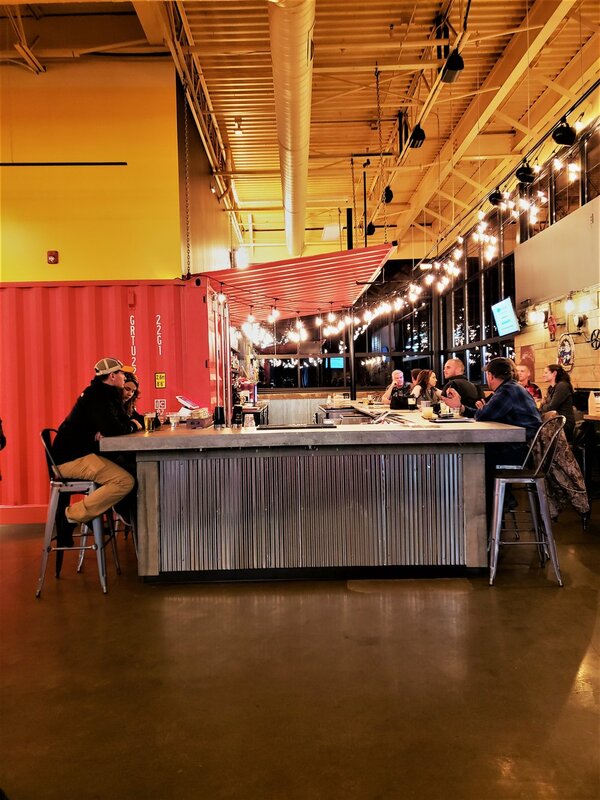 Maroon Arts Group in Columbus, OH has turned containers into an art gallery, a stage and a restaurant called the MPACC Box Park. Gymnasiums and sport centers. It’s pretty neat to say you can get your energy out while being active in a shipping container, Dunraven’s Sports Hall in Streathan, London. Hotels. Super Cubes customer Alchemy Architects built a 20’ stand-along, off-the-grid hotel room. Student housing facilities and schools. The most classic example of this is TempoHousing in Amsterdam. Emergency hospitals/disaster shelters. Containers can be moved around quickly and easily, making them a choice for quick response. The real hold-up here has been finding the way to create government-approved solutions that can be made where they are needed and at the right price point. 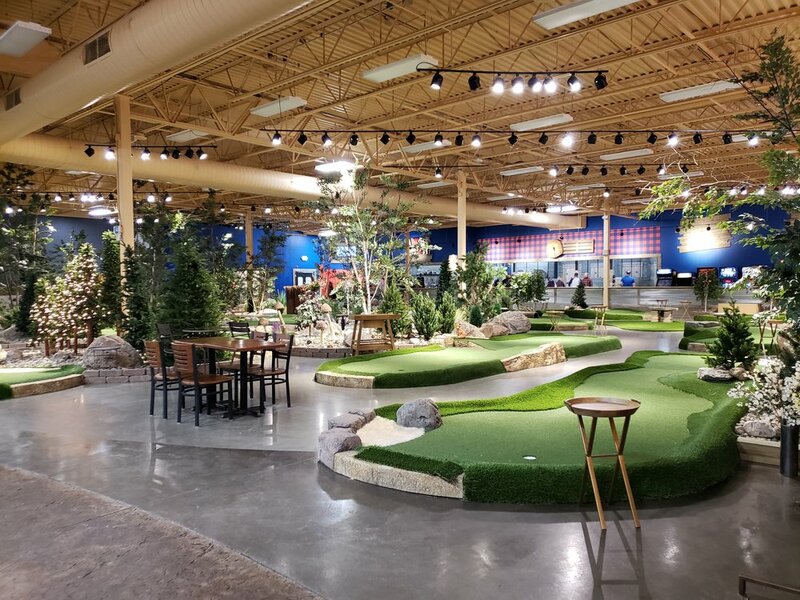 Nurseries and indoor gardens. This is such a great, sustainable way for locally grown food just about anywhere. Check out how they do it in Antarctica, Las Vegas and just about anywhere you can set down a container. To find the right container for you, just contact us directly at 877-374-5452. We’d be happy to help make your vision a reality! 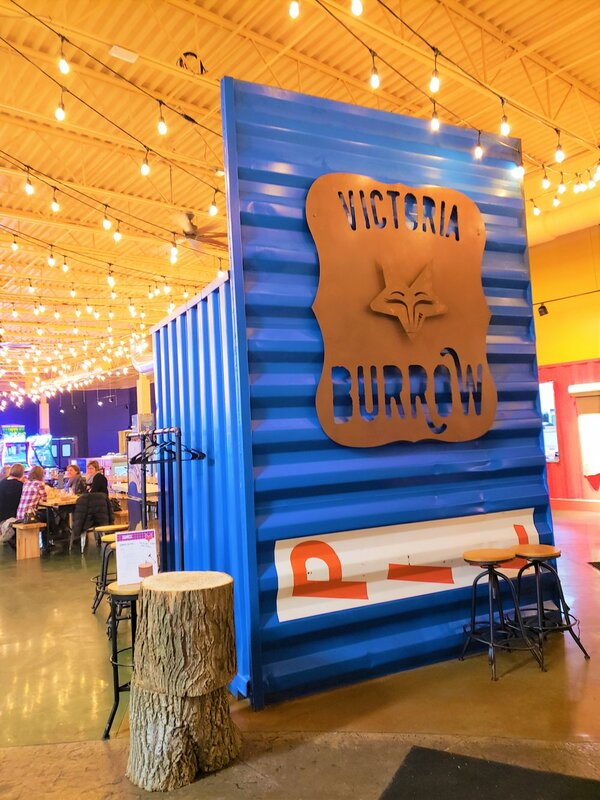 Victoria Burrow in Victoria, MN recently opened. 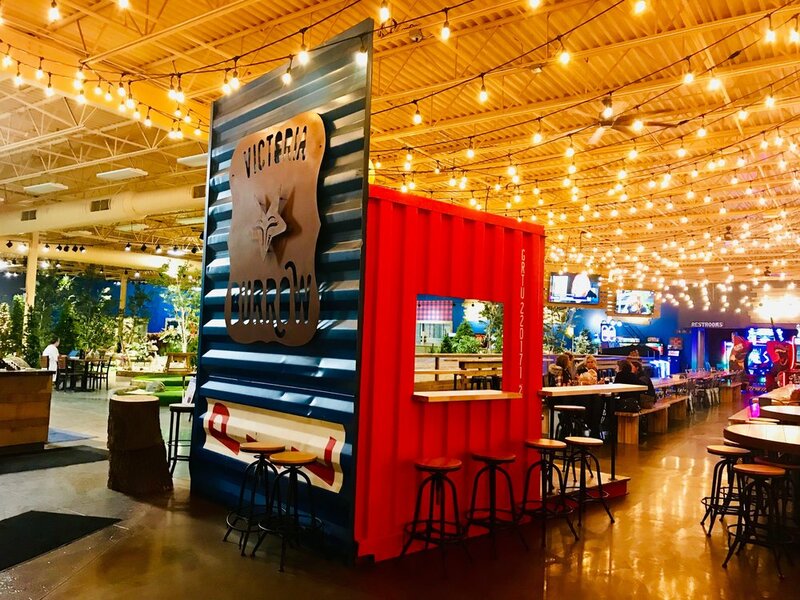 The restaurant features street food and drinks served out of our shipping containers along with a wide range of fun activities — axe-throwing, mini-golf, bocce ball, virtual reality, an arcade, darts, bean-bag toss/corn hole, oversized Connect 4 and more! Victoria Burrow bought two 20’ containers from Super Cubes - a red one-trip/”new” container and a blue used/wind- and water-tight container. They cut up the containers to use as decor throughout the restaurant. 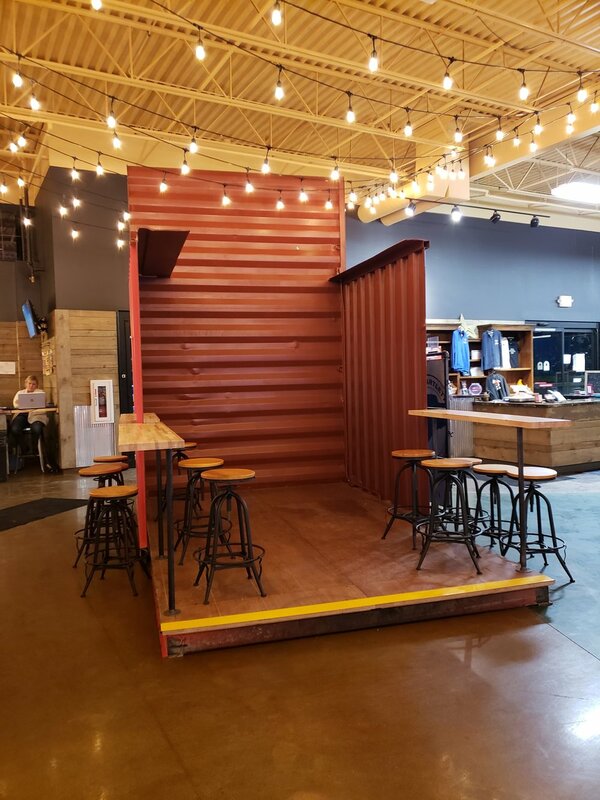 Customers are able to experience our containers by first walking through a set of blue container doors and then are greeted by a container display in the entry way. Another cool attraction is the restaurant bar. 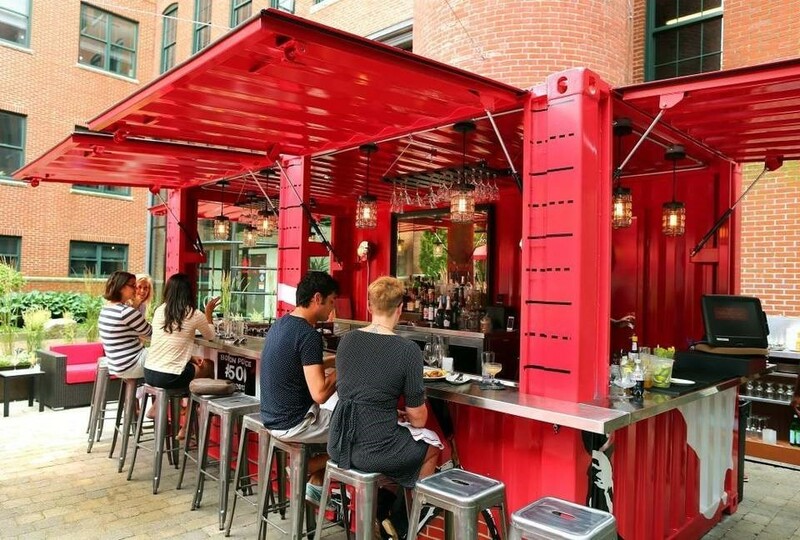 The bar is physically made up of red container doors, side and portions of the container wall that are awning over the bar area. If you ever want to experience seeing a container from the inside, here is your chance! You are able to sit inside one of the containers while enjoying your meal. 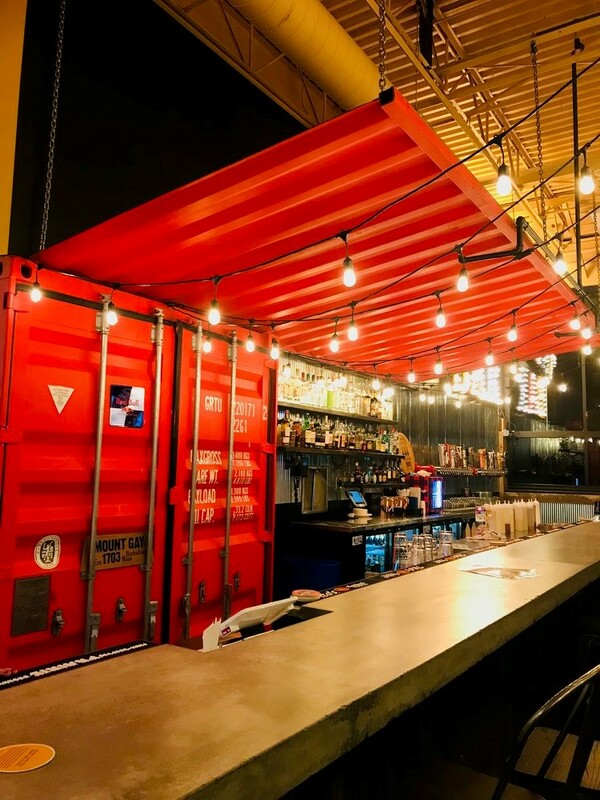 You can hang out on the original container floor which also has an opening to the unique bar. The container area acts almost as a private seating section within the bigger space of the restaurant. 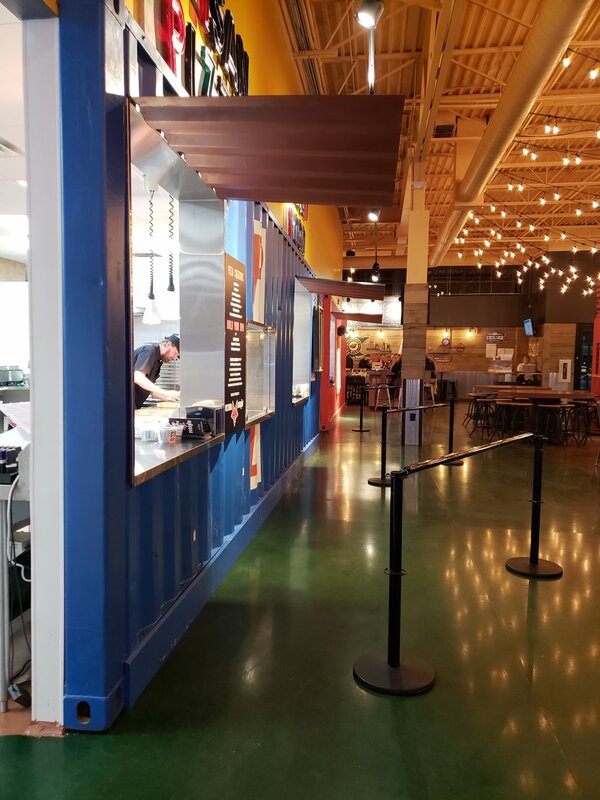 From “inside” the container, customers can REALLY take in the physical container structure, as well see all other distinct aspects of the restaurant. If this seating area is taken up, no worries! Tucked back by the axe-throwing area, there is a second smaller seating section made out of container roofs. Diners also can experience the containers up close when ordering and picking up their food. Similar to food trucks, all food items are ordered and picked up at concession windows that are made out of the containers. 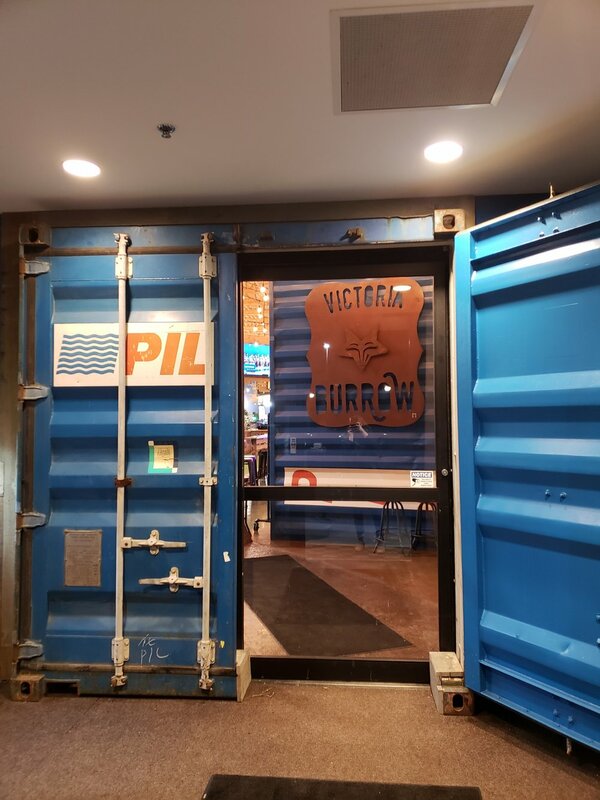 We really enjoyed seeing the containers transformed — from first meeting with customer at the container yard to pick out their containers to viewing end product - Victoria Burrows restaurant! To get more of a live effect, just click on all of our pictures! Now, do you have big plans for containers? Call us at 877-374-5452 and we’ll help you with it! You have your basic design work done, so now what? Now, comes the fun part - figuring out how to make your vision a reality. The first big question is about the modifications to your container. Who will do them and how will it come together? Today, we’re going to tackle the actual modifications, other services you will need to bring in and lastly, how to figure out how long it will all take. Turning your design into reality will probably involve physically cutting into the actual container. For example, containers are cut up to add in doors and windows, open up walls to create new open spaces, brace the container for stacking and much more. The first big question around modifications is who is going to do it? Do you want to do the work yourself or have someone do it for you? Either way in both cases, Super Cubes can help. For Do-It-Yourselfers (DIY’ers), we have container modification kits. Most of our kits consist of a door, window, air condition, the framing, all hardware needed to operate it and etc. Please be aware, you do need to be able to cut and weld in order to install them. If you are able to install, our do it yourself kits are a great way to make your container work just the way you want it. If you are unable to cut and weld, we can help! We can do the modifications for you. We can do as little as just cutting openings, adding in frames, all the way up to finishing the whole interior of the container . How much or how little is totally up to you! We have several shops throughout the United States that can do those modifications and pricing does vary from shop to shop. Modification pricing is based on the specs of a project. If you’re looking for pretty straight-forward modifications, we’re happy to work off of a sketch you make up yourself. However, we just ask that you give us as many details as possible. What kind of door do you want? What size windows? Do you care what kind of insulation? What should we cover that insulation up with for your interior walls? 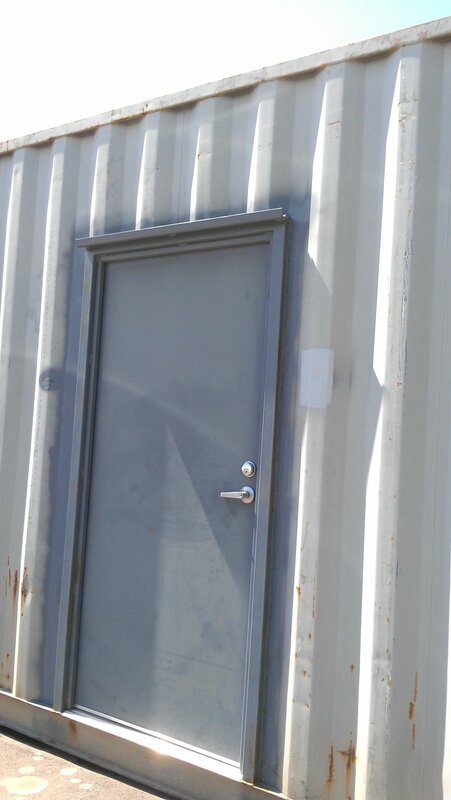 If you are cutting large openings between containers, we will need to know how you want to support those openings. All of these questions have cost implications. So, the more details you give us, the more we can help you. If you already had design work done for you, great! All those questions are usually answered in those plans. What else will you need to make your project a reality? That will vary depending on the scope of your project. The general things to think through are the delivery, the foundation for your project and are you in need of a general contractor and/or subcontractor. Delivery. We can deliver your containers either with a tilt-bed truck or flat-bed truck. The type of truck will depend on your specific delivery location and what will work best in your situation. For smaller projects where you have the spot prepped for your container, we can usually set it where you want it, provided we have enough space on firm ground for delivery. If you have a foundation, you will probably need a crane to put the containers in place. Foundation. 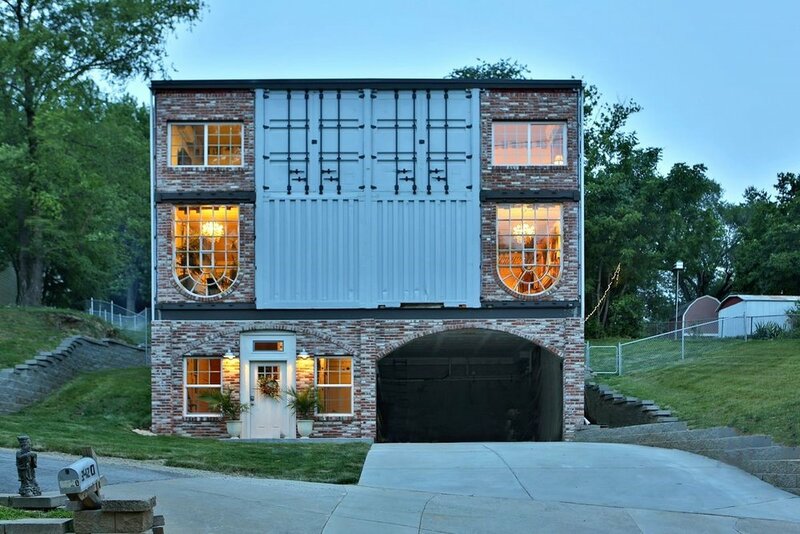 If you are building a multi-container building, you will generally need a foundation. The details of that were probably sorted out as part of your design and feasibility work (See Part 1 of this series for details). Our tilt-bed trucks have to drive over the area where we set the container down, so we cannot deliver a container on a traditional foundation. You can see tilt-bed delivery videos on our Delivery page. If you are setting containers on a foundation, you will need a crane to set the container in place. (Picture) We can work with you to make sure that goes smoothly. To see how craning containers into place work, check out these blogs: Crane day for container home and Day 2: Making it a house. We did it in two steps – the first floor came in one day and the second floor another day. General Contractor. The scope of your project will help you determine if you need a general contractor or other sub-contractors. 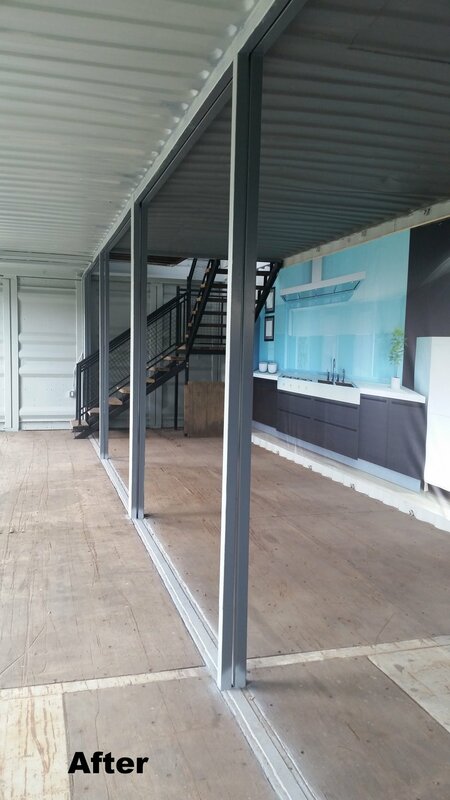 If you are doing a multi-container project, you will probably want to finish off the container onsite. It is much easier to run the electricity when you have the containers set together. While we can stud containers before they go out, you will want to insulate them after the electric and plumbing go in and finish off the walls at that point. For that reason, most customers will engage a general contractor to help them with that part of their project. Even if your containers come completely finished off, you will still need a welder to come onsite to connect the containers to each other and seal up all openings between the containers. The timing of your project will vary depending on the scope of your project. If you are buying a container and doing the modifications yourself, you can get rolling pretty quickly. In most markets, we can get containers to you within a week of when you order the container. Any kits you order would ship directly from our manufacturer to you, which generally takes 2-3 weeks from when you order. If we are modifying your containers, our timeline will vary depending upon the amount of work we are doing to your project. When you order your container and modifications, we set either a delivery date or a date range so you will know what to expect. Hopefully this two-part series is helpful to you. If you have any questions, please give us a call. We love modification projects! Katie’s experience observing two 20’ containers being delivered to a site. Having the right people by you with examining and purchasing a cargo container is key to completing any project successfully. © 2018 Super Cubes LLC. All rights reserved.